The Verdict: The last time I was at the Elephant Hotel a legend was born when a friend fell asleep in a stall. 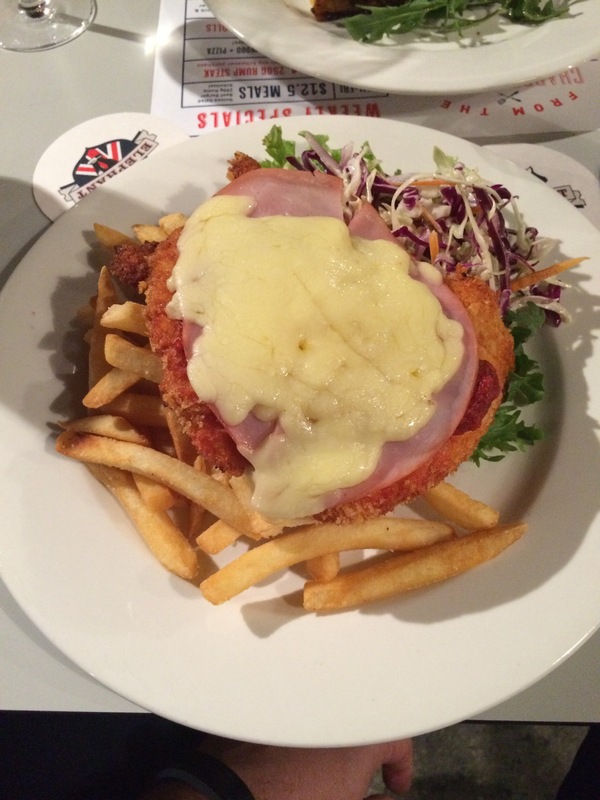 Whilst the Elephant Hotel Chicken Parma was pretty good it certainly did not reach such legendary heights. A lot of the elements of this dish were quite good. Unfortunately, the chicken piece was a little dry and not well crumbed and the cheese was somewhat lacking. Chicken Piece: The chicken piece on the Elephant Chicken Parma was quite a large piece. The crumbing of the piece was quite sparse and the chicken piece was a little over cooked which left it a bit dry. Tomato Sauce: I really enjoyed this element of this dish. The sauce was full of flavor, covered the chicken piece well and cut through some of the dryness of the chicken piece. Ham: Whilst the slice of ham did well to cover a large portion of the chicken piece with this dish it was quite a thin slice and taste wise was largely redundant against such a hearty tomato sauce. Cheese: Whilst the cheese might not look great in the photo and did not go far enough to cover the chicken piece it actually tasted quite nice. Side Dishes: I really enjoyed both the chips and salad on the Elephant Hotel Parma. The salad was a coleslaw that was quite tasty and a very large portion. The chips were well cooked, well seasoned and tasted great. Presentation: Given the size of the chicken piece it was always going to be difficult for all of this food to fit easily even on a largish sized plate. The plate though at the Elephant Hotel was a standard size and thus the chicken piece ended up covering the bulk of the chips. The Venue: The Elephant Hotel is on Wickham Street in Fortitude Valley. I remember it from many years ago as a classic Valley pub with great live music. It has gone through a large renovation since the last time I went there and now possesses a large outside eating area. TAB and bottle shop facilities are available. My Parma cost $21. The Final Word: As I said in the preamble, this was actually a pretty good chicken parma. A lot of the elements were really quite good however the dryness of the chicken piece and the thinness of the ham where real negatives. This entry was posted in Uncategorized and tagged Brisbane, brisbane food, brisbane's best parma, chicken, chicken parmigiana, the elephant hotel. Bookmark the permalink.